We all should lay off the criticism of weather forecasters. Not because they get it right most of the time. But because it is impossible to forecast what conditions will exist, oh let’s say, in the vicinity of Buoy “1BI” off Block Island. How is a mere mortar supposed to forecast that there is a nice sailing breeze several hundred yards from the buoy, and another 100 yards to the south boats are spinning in circles unable to fill their sails? And at the buoy two boats are sailing in opposite directions, both going backwards, with resect to the buoy, in the current. No one can. And if fact it’s hard to believe even when you’ve witnessed it. Spring Off Soundings was an extreme exercise in micro-forecasting. If you can sniff a wind shift before the wind knows it’s going to shift, this was the series for you. Friday’s race started downwind in a light Westerly but totally sailable breeze.The fleet of nearly 130 boats faced a robust incoming current near Watch Hill. The race committee sent the faster boats to Nebraska Shoals and the smaller boats directly to 1BI. They added a twist by using the often plotted but rarely used mark “Z,” which is located west of Block Island’s Great Salt Pond. The course looked like a Z, or as one of our crew observed, an “N” on its side. Huh? Being on Chip Puccio’s J/34C Zeus, we thought the course was good karma. We had Z power. But we also owed time to every boat in our division, so a short, fast race would favor us. That didn’t happen. The leg to 1BI was a nice downwind sail with not much to offer in the tactics area. Pole, no pole. Crew move windward. Crew move to leeward. Crew move forward. Crew move back. That was about it. The approach to 1BI was an exciting time, since a good deal of the fleet converged there at the same time. But we got around with a slight dust up and headed off to Z. Since the forecast called for a SW breeze to fill in, a lot of the fleet tried to position to get that. But the waning, but not dead NW, fought with the fledging SW creating dreaded huge wind shifts and dead spots. For boats in the wind’s grace, great gains could be had. If not in grace, good position in the fleet could evaporate quickly. On Zeus, several of the crew are pretty good at anticipating and reacting to shifts. So we picked our way through the maze and got the gun and a corrected second to Larvik. Saturday started with great hope. We all recalled last year’s Saturday race in which there wasn’t enough wind to cross the line but which filled in to make a rollicking sail -a parade- but great sailing. So we hoped the forecast for a SW breeze would be correct. It sorta was. The RC posted the marks 4 and B. 4 is the buoy on the SW corner of the island and B is 1BI. It is assumed that the race would be around the island counterclockwise. But some of our crew noted that you could sail that course without rounding the island. We engaged in some “banter” about that, and as we were the RC made an announcement that a little know codicil of course B is that the island has to be kept to port. OK – it’s around the island. But what is course B? No matter. The starts went off in a perfectly adequate 7-knot breeze from pretty much the SW. 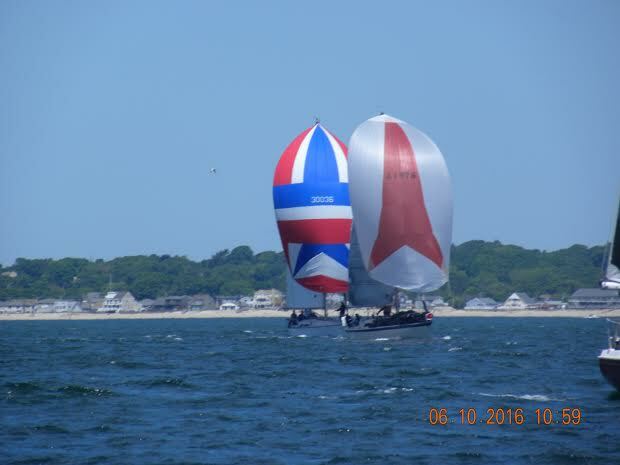 The Non-Such fleet stayed away from the West shore of the island and the first non- spinnaker division stayed more to the beach. The tide was lightly ebbing due to begin the flood at 11 am. We were the third start so we had a good view of each side. The Nonsuchs started to bob. The breeze was going kaput. Beach was looking good for a while then outside perked up. Our fleet split since each was just trying to find some breeze. It went on going back and forth and the fleet traded tacks down the island. We had our 135 up and the 150 boats were just faster. So we struggled until the mark R4, and rounded third in our division. Looking back, it was clear the wind was dying. And now with the flood underway we were going to have a slow leg across the southern end. The classes behind us were going to have a very difficult time if some more wind didn’t come up. We did have a slow leg, but the boats with the 150s were having a worse leg and we found ourselves leading by the end of the leg. And then the rain started. The rain brought some more breeze but it never really filled in. It still was pretty slow and we were going to have a hard time making up our TOT gap. As the fleet approached 1BI the breeze quit. And now the ebb was full on. The leaders were having a rough time rounding. There were some streaks of wind and we found one. Ahead of us boats were sailing East so they could round going West – never good to have to sail away from the mark to round it. And we were getting sucked into the black hole. The flood was carrying us across the sand bar and there was no wind. Suddenly, one crew called out that he felt some shear on his face. We changed tacks and the wind filled in. We were able to sail to the buoy, slowly, but with enough speed to round. Boats yards behind us were spinning. The flukiness continued on the other side of 1BI, but we were moving. So were three of the other boats in our division. There was another round of shiftiness as we approached the line and had an exciting photo finish with Larvik, who beat us Friday. We got the gun again, but didn’t make up our time. We were soaked, a bit cold and tired from a long two days of racing in light shifty winds. Next time I run into a weather forecaster I’ll be sure to give ‘em some love. For Results, go to http://www.yachtscoring.com/emenu.cfm?eID=1636.